The First Epistle to the Thessalonians, usually referred to simply as First Thessalonians, written 1 Thessalonians, and abbreviated 1 Thes., is a book from the New Testament of the Christian Bible. 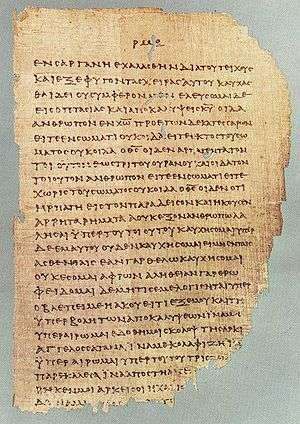 The first letter to the Thessalonians was likely the first of Paul's letters, probably written by the end of AD 52, making it the oldest book in the New Testament. 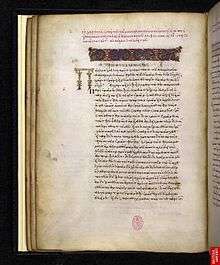 It is perceived to be theologically incompatible with Paul's other epistles: elsewhere Paul attributed Jesus's death to the "rulers of this age" (1 Cor 2:8) rather than to the Jews, and elsewhere Paul writes that the Jews have not been abandoned by God, for "all Israel will be saved" (Rom 11:26); According to 1 Thes 1:10, the wrath of God is still to come, it is not something that has already shown itself. 1 2 Raymond E. Brown, An Introduction to the New Testament, Anchor Bible, 1997. pp. 456–466. ↑ Best, Thessalonians, pp. 22–9. ↑ "The only possible reference to a previous missive is in 2:15...." Raymond E. Brown, An Introduction to the New Testament, Anchor Bible, 1997. p. 590. This article incorporates text from a publication now in the public domain: Easton, Matthew George (1897). "Thessalonians, Epistles to the". Easton's Bible Dictionary (New and revised ed.). T. Nelson and Sons.